Collection: Yes. Donated to the Flight Sim Museum by Dan Crenshaw. Comments: Part of the most complex and popular World War II sim series of the early 1990s. Comments - The most complex and popular World War 2 sim of 1992. Comments - ATAC (Advanced Tactical Air Command) puts you in the position of group leader of a mixed squadron of F-22's and AH-64's deployed to Colombia by the United States. Those were the days! A 270 page manual printed on glossy stock and well bound in a size ideal for throne room reading. 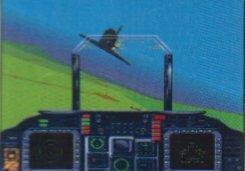 As well as heaps of tables detailing air-to-ground weapon effectiveness there was diagram after diagram on air combat manoeuvres. Not to mention the 3 full - colour maps! After scanning the material for this museum entry I moved with bated breath towards my P166 laptop, 3 disks in hand, all psyched up for some retro-viffing. Alas it was not to be.... there was data corruption on Disk 1 ... Aaaaaaaaaaaaagghh! Never mind. www.simhq.com sent me a copy with working disks and this time I at least got to see the menu screens! Comments - The cockpit is simple looking now, but in 1990 it was state of the art! You could configure the MFD's to your taste as well. You could fly the Apache, Blackhawk, Osprey or the LHX. The Boeing Osprey VTOL which was featured in the novel "Hammerheads" by Dale Brown . This was the only simulation of the Osprey until the year 2000!